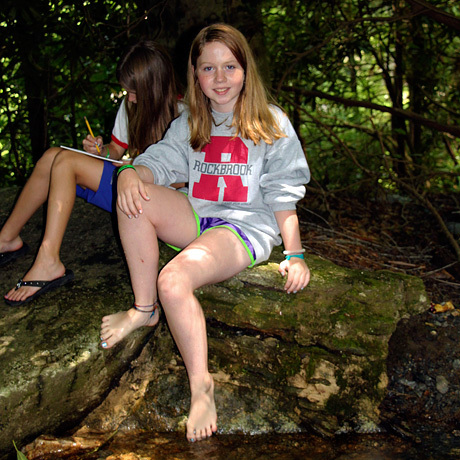 Rockbrook is a nature camp for children set among fantastic natural beauty. It's natural surroundings include 3 large waterfalls, 2 prominent rock face cliffs, record old-growth trees and the French Broad River. 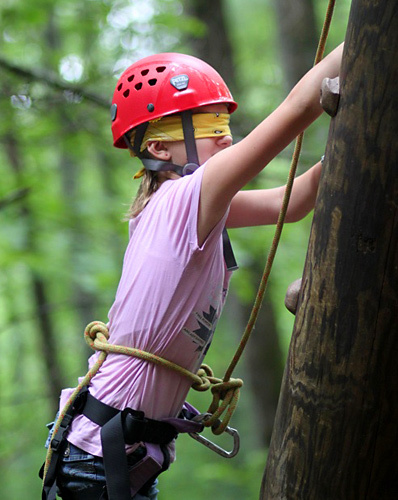 Rockbrook is dedicated to getting girls outside, to providing nature camp programing that inspires them to learn more about and appreciate the natural world. The lasting benefits for children that follow this broad immersion in nature are wonderful parts of camp. Glancing through our online photo gallery today, you may have noticed that the girls are all wearing long sleeves. It might be a t-shirt or a sweatshirt, or likely a Rockbrook fleece, but all morning long we needed to bundle up a bit because it didn’t feel much like summer around here. It was more like the fall with the low temperature of 54 degrees when we woke up at 8am this morning. While odd for us in late July, this kind of cool, low humidity weather makes everything sparkle at camp. Waking up under warm covers in our open-air cabins, adding a layer of fleece while clicking the floor loom in Curosty, and biting into the fresh mint chocolate chip muffin, all felt especially good this morning. Up above was the deepest blue sky, not a single cloud anywhere, and the sun felt instantly warm when you stepped out of the shade, even as it warmed to about 75 degrees in the afternoon. Summer in the mountains can bring the most surprising and wonderful weather. 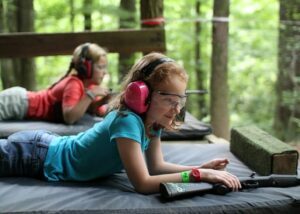 Yesterday, Bentley wrote about how camp has helped her daughters (and herself) gain social confidence when meeting new people or encountering unfamiliar social settings. She saw attending a sleepaway summer camp a perfect setting to develop that skill because, after all, it’s inevitable you’ll be doing unfamiliar things and meeting new people at camp— the girls in your cabin, in your wheel-thrown ceramics class, or in your whitewater raft on the Nantahala River. Everyday, there’s someone new to meet and something new to do and experience. (“Did you try that pineapple salsa at lunch today?”) From this angle, camp life means immersing kids in the unfamiliar— experiencing first-hand strange food like homemade ginger coleslaw, odd weather like this morning, quirky people like that counselor from out west, challenging activities like aiming a real gun, alien creatures like those HUGE wolf spiders occasionally found in the shower, and so forth. 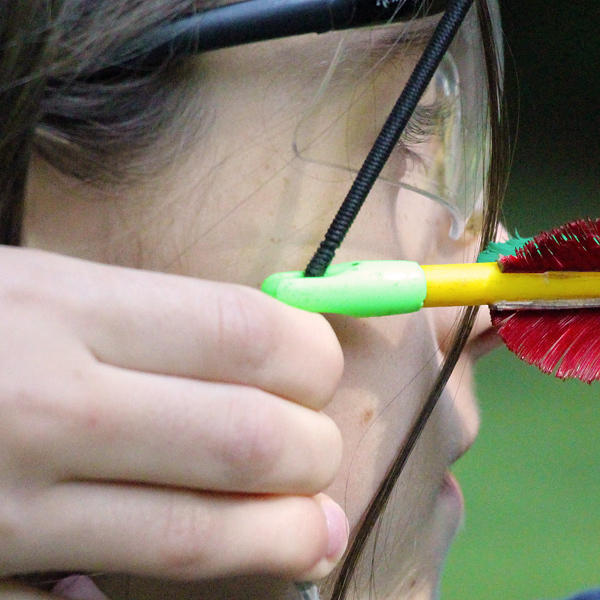 While camp is providing girls new experiences and offering a range of fun activities to try, it’s more importantly pushing them beyond what they know, confronting them with the exotic. 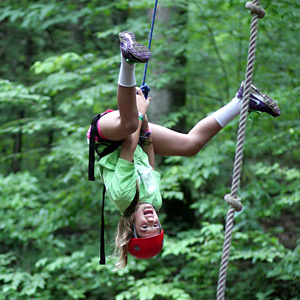 Camp life happily leaps right out of every “comfort zone,” and in this way, is intentionally un-comfortable. And that’s a good thing! Obviously, we don’t want camp to imitate the comforts of home. 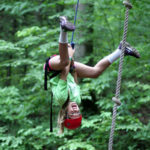 Many of the benefits of camp life spring from those differences— unplugging from technology, being active outdoors, and managing everyday decisions, for example. Personal growth, learning of the most profound kind, requires a little shaking up and a surprise now and then. We want our kids to have these novel experiences because they are unfamiliar and because they challenge them to grow more competent. For this reason it would be a mistake to insist we make everything “easy” at camp, for example to make sure the lake isn’t too cold or that she already know everyone in her cabin. As parents, we often spend our time helping our children be comfortable, keeping them happy, and providing everything we can to smooth their path, but that’s the paradox of camp. It’s both uncomfortable and fun. It makes our girls happy while safely challenging them. Camp is as joyful as it is unfamiliar. What makes this paradox possible at Rockbrook is our camp culture. It’s our emphasis on community, and the values that support it like kindness, caring and generosity. We all know that everyone here (counselors and campers alike) will be quick to support our efforts and is more inclined to cooperate than compete. Enthusiasm and encouragement bubble up everywhere at Rockbrook strengthening our courage to let our true selves blossom. We celebrate silliness, creativity, and costumes! We love singing, dancing, playing, and doing almost everything together. In this kind of community, what’s unfamiliar becomes part of the fun, and what’s at first a challenge becomes another opportunity to experience something new regardless of the outcome. 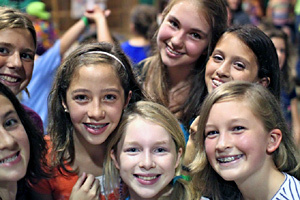 What makes camp “fun” is another whole topic to consider, but I think the Rockbrook camp community is a big part of it. For about half of the camp, almost all of the Middlers and Seniors, today included a whitewater rafting trip down the Nantahala River. We ran 2 large trips, using our own equipment and guides: one in the morning and a second in the afternoon. 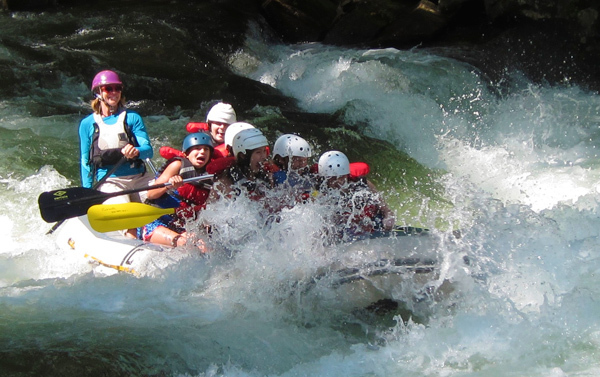 Perfect sunny weather added to the excitement of rapids like “Delbar’s Rock,” “Whirlpool,” “The Bump,” and of course the “Nantahala Falls.” These are high-pitched trips, partly from the rapids but equally from the icy cold water splashing about. It was a great afternoon of whitewater adventure. 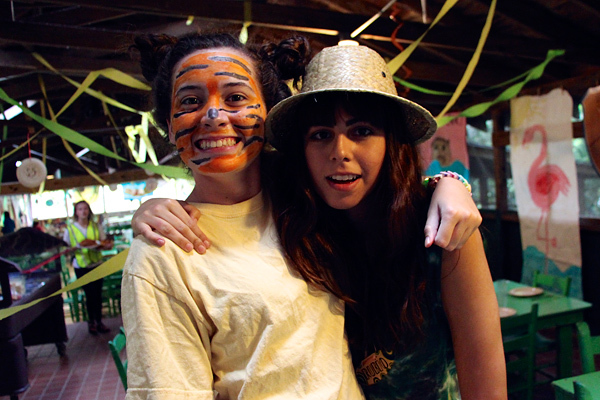 When we all arrived back at camp, a special jungle/animal themed dinner called “A Night at the Zoo” was ready to begin. We had just enough time to race back to the cabin to throw together an animal costume. Maybe that meant simply wearing a squid hat, or painting a few whiskers on your cheeks, but there was also a giraffe and several tigers in the dining hall too. Jungle-themed decorations and posters on the walls helped set the mood, while the girls had a great time singing animal songs (e.g., “The Lion Sleeps Tonight”) and dancing to a few related pop songs (like “Roar” for example). We gobbled up pizza and salad, and finished with chocolate chip cookie dough for dessert, making the whole dinner a special event. During another tour this week, I was struck how the setting at Rockbook is in many ways extreme. It’s so drastically different from the straight lines, smooth surfaces and pure tones of the outside, “civilized” world. Around here, the complex forces of nature, the curls and swirls of natural beauty, shape us and provide so many wonderful— wonder-filled —experiences… slabs of grey granite jutting from the ground at odd angles, clear streams sparkling in the sunshine, ancient trees too large to hug, tiny insects busy scavenging the ground, shaded by fractal-shaped ferns. Rockbrook has this organic feeling, and it’s something we cherish and foster. Rather than level every stepping stone, trim back each encroaching rhododendron branch, or eradicate all of the spiders that might wander into the showers, we want life at Rockbrook to include the natural world (at least a healthy, regular dose). It’s a priority that informs a great deal of what we do. Camp is simply outdoor living. It’s a life immersed in, rather than shielded completely from, the weather. It’s a daily encounter with unfamiliar (and happy, given all the rain we’ve been having this summer!) plants. Tiny critters cross our path all the time. It’s a life that weaves mysterious forest sounds with the constant rush of water coming down the mountain. Camp means having a flashlight ready when it starts to get dark, belting a wide-eyed scream after jumping in our very unheated lake, and ultimately getting a little grubby most days… Perhaps I should say “extremely grubby,” in many cases. After all, these are enthusiastic children playing outside, and they’re not holding back. If you can imagine your girls living outside for this many days, probably not caring too much about how wet and grimy their clothes become, you might be extra cautious when you open their trunks back home! Fighting “Nature Deficit Disorder” like this, is just bound to be messy. Hmmm… Maybe by insisting that our kids always be perfectly clean and starched, we are contributing to this deficit, compounding the negative effects associated with it. The equestrian staff has been celebrating the recent stretch of dry weather we’ve all been enjoying. It’s been an extraordinarily wet summer this year, and that has been frustrating our riding program because when our fields are wet and muddy, they become too slippery to ride safely. Now, we are finally teaching mounted lessons all day long, helping girls learn the basics of horsemanship, and progressing to more advanced skills when they are ready. 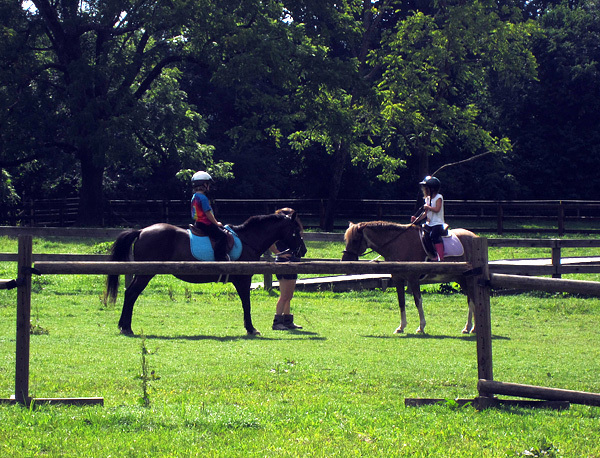 I think everyone —staff members, campers and horses alike— are happy to be busy riding. Christina, one of our fantastic Adventure Trip Leaders, led a group of girls backpacking and camping at a spot known by some as the “Enchanted Forest.” This truly is a magical place to camp. Tucked a couple of miles into the Pisgah National Forest, a large stand of White Pine trees lines both side of the trail as it follows a small stream. Decades worth of brown pine needles cover the ground with ferns and other clubmosses providing green accents. After packing in their tents, food and water, the girls spent a wonderful night in the forest— roasting marshmallows around their campfire, goofing around and chatting late into the night, and feeling a morning chill the next day. All of the mini session Middlers and Seniors who wanted to go whitewater rafting took their trip today. With a few remaining full sessions girls joining them, this turned out to be 55 campers. About half of those elected to spend the night beforehand at our Nantahala outpost property in Swain County. This is another chance to be outside and enjoy a campfire, complete with s’mores of course, before bed. The girls had a grand time singing songs, taking turns telling jokes, all while staring hypnotically at the flickering fire. Around 9am we met our veteran rafting guides and all of the RBC gear at the river’s put-in, and after suiting up and hearing the guides’ safety instructions, the rafting hit the water under glorious, bright sunshine. For the next two hours, it was a wild ride filled with laughing and squeals of delight with every crashing wave of the rapids. 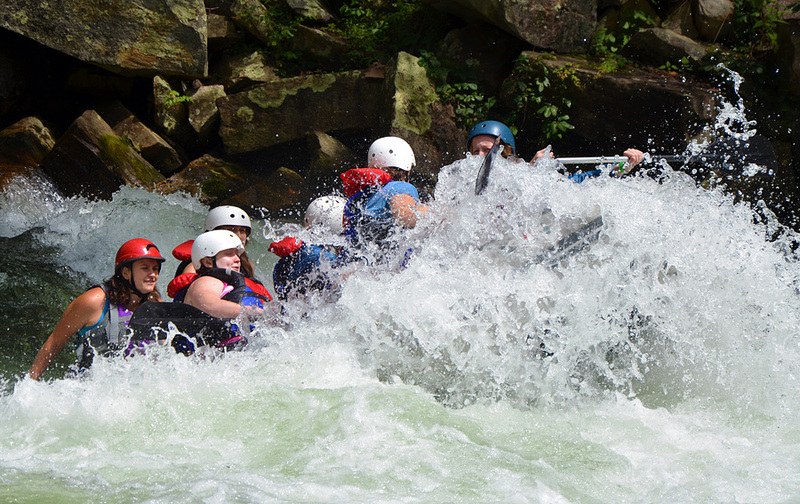 This last photo was taken at the final big rapid called the “Nantahala Falls” and as you can see, it’s a great one. After a good sized hole at the top, all of the river channels in a Class III drop producing this kind of splash. It never fails to get everyone’s heart pumping, and once safely at the bottom, a smile on their faces. Probably the most common arachnid (the class that includes spiders) you see around Rockbrook is this little guy. You probably recognize him as a “Daddy Long legs Spider.” And you’ve also probably heard that they are the “most poisonous spider in the world,” but (luckily!) they are not dangerous because their “fangs are too small and short to bite through people’s skin.” With that kind of reputation, this is definitely a little scary no matter what. The problem is; it’s not true. 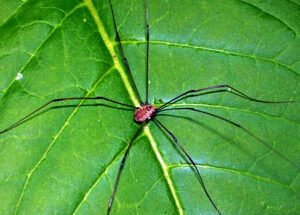 Also known as Harvestmen, these little guys do not in fact have fangs or any venom at all. It is true their mouth parts are quite small, so they can’t bite you. Overall, they’re totally harmless. They also don’t spin webs because they lack silk producing glands. It fact, technically speaking they aren’t even spiders! They do have eight legs and are in the same biological class as spiders, but are in a different order. It’s just a big misconception that seems to be repeated every summer at camp. There are more than 100 species of Harvestmen in North America, and they are particularly common in rich deciduous forests (like Rockbrook!) where there are lots of other small insects, fungi, and plant matter they like to eat. When you’re at camp this summer, keep an eye out for these fascinating, and harmless, forest critters. 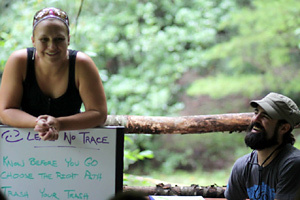 Today Rockbrook welcomed Mark Ardagna and Tara McCarthy from the Leave No Trace organization. They are currently traveling around the country on an e-tour, providing educational programs for young people that use the Leave No Trace principles to promote responsible enjoyment of the outdoors. Rockbrook was very fortunate to have Mark and Tara spend the day with us and present several workshops to our campers. Leave No Trace (LNT) is a nonprofit, educational organization dedicated to “responsible enjoyment and active stewardship of the outdoors by all people.” It advocates seven principles (not so much rules) to minimize negative impact on the environment from outdoor activity weather it be a camping trip in the woods or simply walking your dog in a city park. Addressing these principles, Mark and Tara discussed with the campers what it means to plan and prepare for outdoor activity, the importance of traveling and camping on durable surfaces, disposing of waste properly, preserving what we find outdoors, safely minimizing campfire impacts, how to respect wildlife, and being considerate to other people when out. They led an observation activity where the girls broke into small groups and studied a small area of the forest enclosed by a circle of string. The girls were surprised just how many different organisms were in such a small area of the forest, and how the more they looked, the more they noticed. Imagining the entire forest, something many, many times larger than their small circle of string, the girls really understood how following the LNT principles can have such a huge impact. Everyone really enjoyed meeting Mark and Tara and we all appreciated learning so much from them. The highlight of the evening, as you may be able to guess from these two photos, was our dance with Camp Carolina for Boys, our two dances I should say because we held two simultaneously: one here at Rockbrook for the younger set, and one over there for our older girls. We’ve found over the years that splitting the girls and boys up by age allows us to adjust the music and the feel of the dance to match the different interests of 13-year-old and an 8-year-old, for example. Some girls are happy to opt out of the dances altogether, so we always provide an easy way for them to do that, to team up for a “dance alternative” activity of some sort involving an art project and snack. 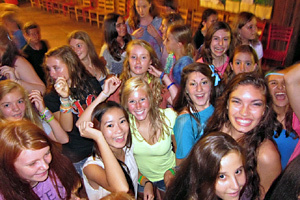 These dances are a lot of fun for the girls, even if they sometimes start out with a few jittery nerves as well. Fortunately, the counselors are there to help with this, to dress a little silly, not making a big deal about their looks, to be carefree about their dance moves (again, goofy is good! ), and to encourage group dances. No pressure, just the fun of being together. We’ve talked about Richard Louv before, here, here and here, but I just found this video of him discussing the importance of nature for children. It’s a short introduction to Louv’s notion of “Nature Deficit Disorder.” Check it out! As a parent, have you ever felt you were driving around in circles, literally driving your kids from home to school, to sports or dance practice, to other lessons or weekly events? Would you say that your kids are scheduled and busy most of the time? Do they spend most of their time inside, and when they do have free time, how do they spend it? Watching TV, on the Internet, text messaging? All of this is valuable, of course, with each activity exposing children to new ideas, information and challenges, but there’s a growing awareness that if overemphasized it can create problems as well. It’s becoming clear that children need time with nature too. They need the opportunity to explore the outdoors, to play outside without the time constraints of school, to feel the elements and reconnect with the wonders of the natural world. 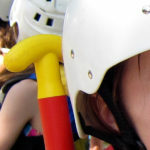 The Children and Nature Network is an non-profit organization dedicated to researching this issue and providing resources for encouraging children’s health through outdoor activity and experience. It’s a great place to learn about the importance for children of direct experience of nature. 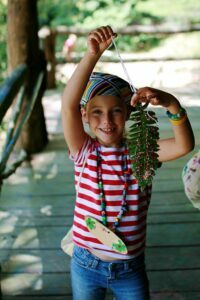 Summer camps, thankfully, are still ways for children to recover from the “nature deficit” they endure throughout the school year. Nature and camp just go together. Particularly at an overnight camp like Rockbrook, nature is a constant companion— the earthy smell, the feel of the weather, the surprising creatures, the plant life that’s everywhere you look. 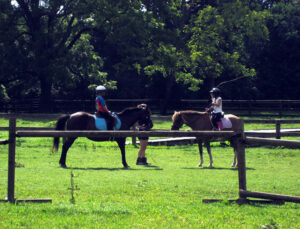 Sure camp offers crafts, adventure, sports and lots of silly fun, but every minute is also a chance to be with nature. It’s the greatest feeling, and is also, incredibly good for you. We just noticed a few maple leaves turning red, and sure enough today in the first day of fall. Hurray! Here in Brevard, in the northern hemisphere, this is the autumnal equinox, and it’s that time of the year when the sun rises and sets exactly in the east and west. You might think that this also means the equinox is that time of the year when the sun rises and sets at the same time in the morning and evening (making the day and night the same length), but this is not the case. The reason for this is a little complicated, but it has to do with the size of the sun and the curvature of the earth. 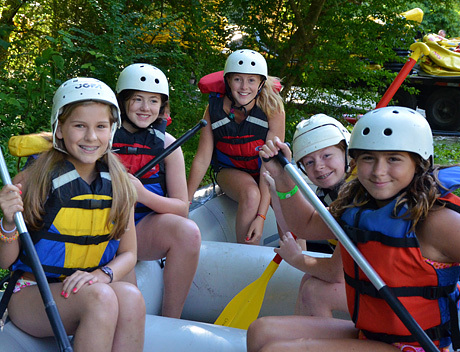 Your time at camp and all the fun you had this summer may seem like a distant memory, but just think, you’re now that much closer to next summer! Only three more seasons to go! Richard Louv, who we’ve mentioned before, has published a new and interesting article discussing the benefits of outdoor play, the problems caused when it’s neglected, and what we might do to encourage it. The article is in the March-April 2007 issue of Orion magazine, and is entitled “Leave No Child Inside” (link to the full article). Louv has no trouble documenting an overall decline in the amount of time American kids spend outside, and likewise the numerous problems associated with this “virtual house arrest” (“threats to their independent judgment and value of place, to their ability to feel awe and wonder, to their sense of stewardship for the Earth—and, most immediately, threats to their psychological and physical health”). 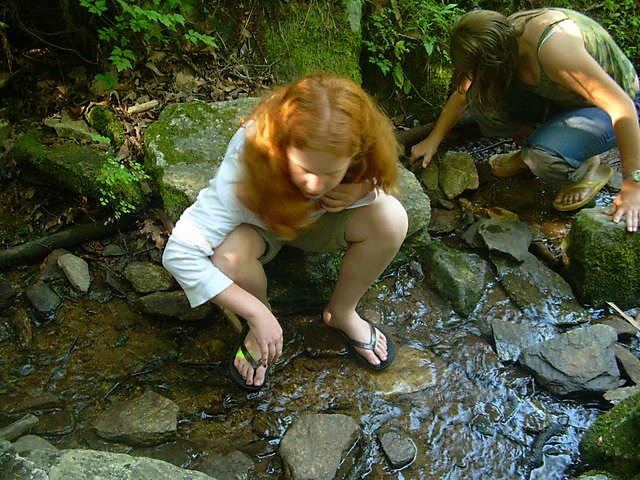 Despite the forces behind this “nature-deficit disorder” (“disappearing access to natural areas, competition from television, smart phones and computers, dangerous traffic, more homework, and other pressures”), Louv also finds a “growing movement to reconnect children and nature.” What’s crucial here is the positive childhood experience of nature most of us adults share and recall fondly. 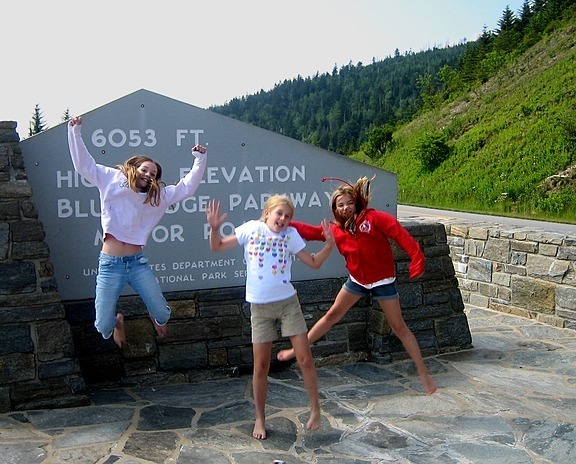 No matter what our current profession, level of income, or political views, we love those experiences… turning over rocks in the stream, hiking through tall ferns, catching a glimpse of a hawk overhead… and we want our children to have them too. What a great shot! 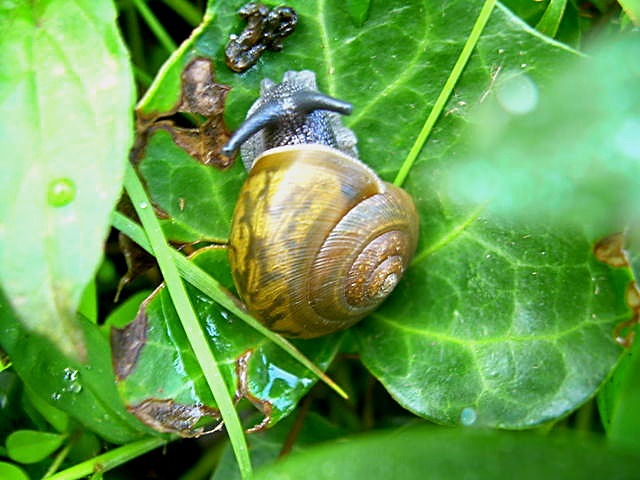 Could it be the rare Noonday Globe Snail (Mesodon clarki nantahala) found only in North Carolina? We’re not sure, but we think it’s a really cool example of the discovery that nature provides girls around camp (It’s lush, to say the least!). A camper in the photography activity took this photo last summer wandering around camp. Yikes! What’s that?! It’s a spider Sarah spotted at camp a few weeks ago, and odds are it’s a female Writing Spider (Arigiope aurantia). It’s actually a very common spider in North America, and is also known as the “Black and Yellow Garden Spider” or (even cooler!) the “Golden Orb Weaver.” It’s famous for the intricate web patterns it weaves, the web it “writes” with X marks along the strands. 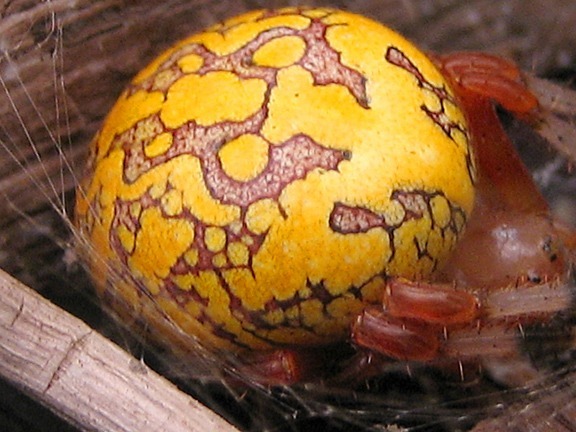 There’s lots to learn about these amazing spiders. Here’s a nice article (with photos) describing the Biogeography of the Writing Spider. Having a chance to marvel at creatures like this is one of the wonderful parts of nature camps like Rockbrook. You never know what cool critter you’ll find. Oh, and don’t worry! The writing spider is not considered poisonous to people.